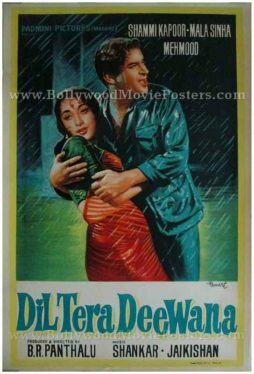 Original Bollywood poster of the hit Hindi film Dil Tera Deewana (1962) for sale. This is an actual surviving original Bollywood movie poster of the 1962 classic comedy, which featured the Elvis Presley of Indian cinema, Shammi Kapoor in the lead role opposite Mala Sinha. Dil Tera Deewana was shot and released in black and white in an era where colour films had already started making their appearance, making this poster highly collectible! Printed and circulated during the very first release of the film (somewhere in the early 1960s), this original Bollywood film poster was designed for publicity of the film but never ended up being used. This beautiful hand painted Bollywood poster features a stunning rendition of the two lead actors embracing under the rain. Originally hand painted on canvas by master Bollywood poster painter V.G. Parchure, this original Bollywood movie poster bears his printed signature in the name of his art studio (Pamart) on the bottom right. Dil Tera Deewana (My heart is crazy for you) is a 1962 hit Bollywood comedy that starred the Elvis Presley of India, Shammi Kapoor in the lead role opposite Mala Sinha. Supporting actors include superstar Bollywood comedian Mehmood, along with other actors such as Pran and Om Prakash. Songs from the film composed by Shankar Jaikishan became a rage and continue to be remembered today. 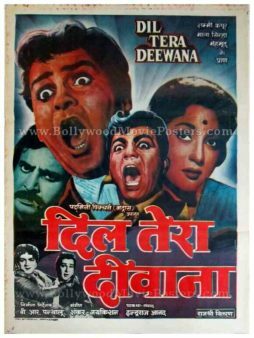 Rare hand painted Bollywood poster of the hit Hindi film Dil Tera Deewana (1962) for sale. This is an actual surviving vintage movie poster of the 1962 classic comedy, which featured the Elvis Presley of Indian cinema, Shammi Kapoor in the lead role opposite Mala Sinha. Printed and circulated a few years after the release of the film (somewhere in the 1970s), this old Bollywood poster was designed for publicity of the film but never ended up being used. This beautiful old hand drawn Bollywood poster features stunning and dramatic portraits of the lead actors, in line with the comic genre of the film. A black and white still photograph from the film is seen pasted at the bottom left of the poster.